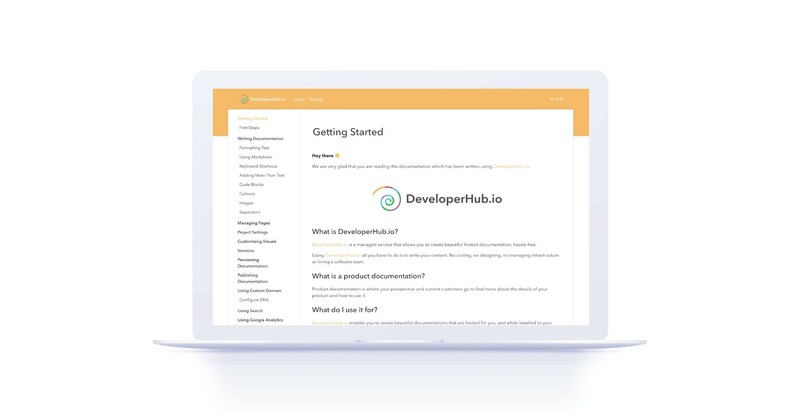 DeveloperHub.io is a managed service that allows you to create beautiful hosted documentation, hassle-free. Basically, you don't have to write one line of code and we'll manage everything for you. Just start writing the documentation! Out-of-the-box, your documentation is hosted on your own subdomain, having lightning-fast realtime search, supporting rich-elements such as images, videos, code blocks, custom HTML, call outs, tables and more. Your supercharged projects are versioned, optimised for search engines and mobiles, and can integrate with third-party services such as Google Analytics and Intercom. The best part of all is that your whole team can collaborate on the documentation pages and format using their preferred method. Developers can use Markdown, technical writers can use keyboard shortcuts, and managers can use the WYSIWYG editor, all in a unified view.